If I stop to think about it, I feel like I'm suffocating. So, I'm going to try not to think about it -- or, at least, not to dwell on it, and today, I'm going to stay busy with Seth and with friends and enjoy the beautiful summer day. But since I "coppped out" on a one-week memorial post for Duncan on the 26th, I thought writing something today would be appropriate. So, here is something sweet for my Duncan today. A week ago, on the Tuesday following Duncan's birth, I received a package from my dear friend Kelly. You will be hearing more about her in the coming weeks as I share with you just how blessed I am to be part of a incredible online community of amazing women. Kelly and I have never met in person. She lives in Iowa with her husband and darling son Oliver. She and I are the unofficial "den mothers" of the group of ladies I told you about in this post back in the fall of 2007. This is the same group of ladies that gave me my Daina and Stacy. 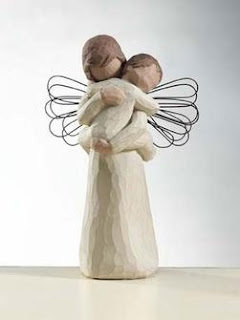 Inside the package was the sweetest card, a bag of dark Dove chocolate, and this Willow Tree figurine titled Angels Embrace. "I went to get you a card, saw this, and burst into tears. I hope you see it as a reminder of the angels welcoming Duncan into heaven, and also as a mother's hug, always there no matter what." I was so touched, and knew exactly what I wanted to do with the figurine. For the longest time, I had pictures of my brothers, Adam and Andrew, in matching frames. But since the pictures were about 10 years old, and because now I have pictures of them each with his respective wife and fiancee, the frames have stood empty. I knew that I wanted to fill them with pictures of Seth and his brother, so I've had Duncan and Seth's ultrasound pictures in them, on top of our piano. The Willow Tree figurine A Child's Touch was a gift from my mom after Seth was born; it stands in front of Seth's picture. And Kelly's gift was the perfect companion for Duncan's picture. The tribute to our sons is completed with the ornament our nurses prepared for us with Duncan's footprints. I know all too soon, Duncan's urn will arrive, and that the sight of that box may bring some sadness. And I'm okay with that, and ready for that. In the spirit of on-line friendships, I need you all to keep my dear blog friend Kendra in your prayers today. This young woman has become SO precious to me, and I can't wait to share with you to role God allowed her to have in helping me through Duncan's birth. But today, I ask that you just lift her up. Sorry I can't be more specific, but I'm sure y'all understand. Thank you!!! I love Willow Tree's. They're so special and carry so much meaning when one has been given. That's a very nice arrangement that you've made. I think it looks great. Monica, I have read your blog since you began you journey of motherhood before Seth you born. I am not sure why, but this one has touched me the most. 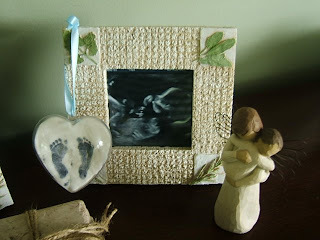 I love the ultrasound pictures and the figurines now make them complete. You write beautifully. Each word is with love. I am so proud to be you mother. 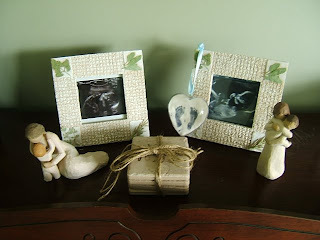 What beautiful fitting ways to display your sons ultrasound pictures and Willow Tree ornaments. Praying. For you and for my sister. Catching up...what a precious, precious gift. I love what you did with them, I think that looks beautiful together. And thank you so much for the call for prayers...you are a dear, selfless friend.